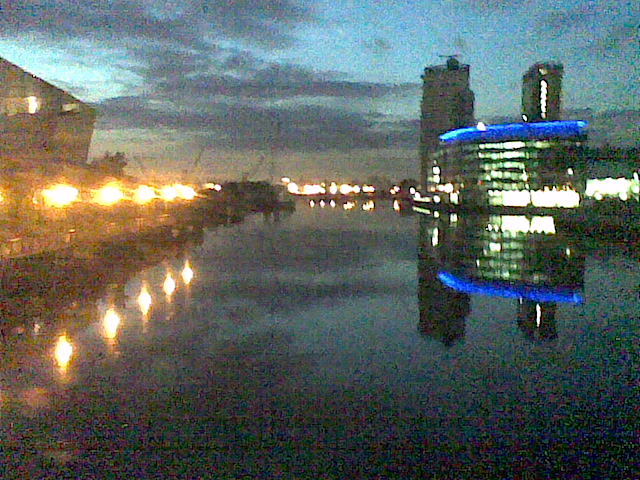 Picture taken heading from Trafford Bridge towards the Lowry along the promenade on my way to rehearsal last night with Ad Hoc dance. There’s a lot of incredible open views in that part of town; the expanse of water pushes the horizon way further out. Im not surewhat it’s like in the day time but theres a real desolate end of the world feel at night.These long quaysides totally devoid of people, only the scale gives a hint to the original purpose and labours of the place. Paintbrush (point 5) under 9th fret playing on either side with left and right hands. So right hand pulls out rhythmic pulses and some rhythm from guitar body. Left pulls on strings behind brush on guitar neck, can also fret some notes here to produce really clipped chimes. Guitar flat in lap brush end 12th fret; percussion on front and sides played with hands and soft mallet; totally open rhythms; timing in response to dancers; they all have individual moves at this point; really open and improvised. Sparse slide guitar around the words “aching, arching, anchoring” and their connotations. Added words form dancers own personal writing. Piece in Em7 and pulling to D for a duet. Really flows in a welcome energetic way; as with flamenco. This is interspersed with slowly, gentle, mournful passages of making sadness, waking up and remembering the flow from before. Interaction of rhythm and movement; not so much finding pulses but watching to find peoples place and individual timing. There’s something with the brain and juxaposition so you start seeing patterns and making sense of whatevers happening? Performance is on 9th November at the Lowry Studio theatre.